Critics of fiction have long been aware that the romantic movement in Europe and America gave a powerful impulse to the art of fiction. The exact nature of that impulse has resisted analysis like so much associated with romanticism. 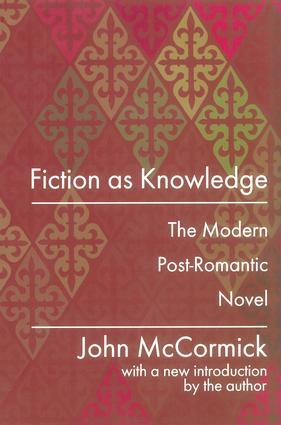 In Fiction as Knowledge John McCormick reaches for precision, proposing that much of the vitality of modern fiction derives from romantic conceptions of history which made available to fiction not merely historical subject matter, but new perceptions of reality, present and past, that pervade the work of many of the greatest writers of the post-romantic period. Beginning with Herder and Hegel, McCormick describes those qualities in historical thought that were revolutionary in the early nineteenth century and rich in meaning for the future. Most prominent of these was the emergence of the idea of individuality, not only in society but also in history. The author demonstrates the vitality of the romantic impulse in the work of seven major novelists of the twentieth century. Marcel Proust's apprehensions of nature in his great novel are seen as Wordsworthian, while as the novel unfolds, history in the form of event and system of organization comes to dominate and to offer a paradigm of the workings of the post-romantic historical imagination. William Faulkner and Andr Malraux are shown to confront history directly, although they do not write "historical" fiction. Herman Broch, Robert Musil, and Henri de Montherlant, uncomfortable with traditional romantic attitudes, still make fullest use of Romantic historical insight to extend the range of fiction as knowledge. Ernest Hemingway, by contrast, is seen as intuitive, a pure product of his novelist's intelligence as opposed to his latter-day romantic anti-intellectualism. Fiction as Knowledge supplies critical insight into the form of the novel as well as into the seven novelists under discussion. Not least, the book is a warning against contemporary anti-historical bias and an appeal to the cultivation of historical consciousness. John McCormick is Professor Emeritus of Comparative Literature at Rutgers University, and Honorary Fellow of English and Literature at the University of York. He is the author of George Santayana: A Biography, Catastrophe and Imagination, and The Middle Distance, by Transaction.